The Hilton Hawaiian Village Hotel has 5 towers and 2 timeshare towers. All guest rooms and suites are in high rise towers with over 2800 rooms in the main hotel part of the resort alone, and the 2 timeshare towers which offer condo type units. 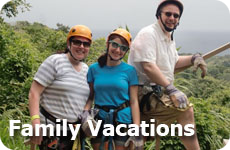 You have many different options for accommodations at the Hawaiian Hilton Village. 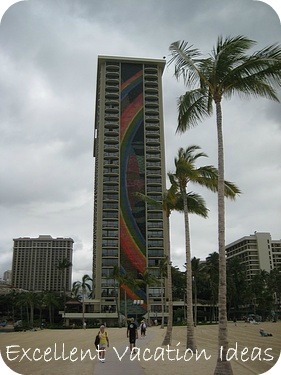 The Hilton Hawaiian Village hotel has made each tower distinctive with what they offer. You can choose from ocean views, extra luxury, location right on the beach, or a room in the tower with the Mandara Spa for easy access. Whatever your taste or desired experience you can find it here at the Village. 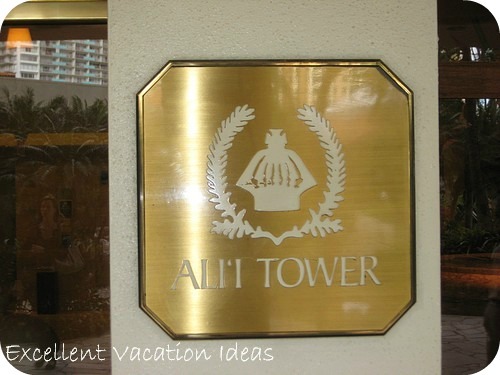 The Ali'i Tower is all about luxury. The Ali'i in ancient Hawaii were royalty. This tower named after that royalty and offers superior service and luxury. It is like a separate hotel within the resort. It has a private guest reception, an exclusive concierge, and a private pool, sun terrace and fitness room. Nightly they offer hors d'oeuvres to Ali'i Tower guests on the Oceanview Terrace, and offer continental breakfast and lunch for a charge. All amenities in the rooms are upgraded including bath robes, and the Hilton Serenity Collection for Bedding and toiletries and a complimentary fruit tray is given to each guest room on the day of arrival. We did not stay here and I heard mixed reviews. Some felt it was worth it - others felt the "extra" charges (like room safe charges) were not worth it. The 31 story Rainbow Tower is located right on Waikiki Beach the Lagoon and the Super Pool, and houses the 2 fine dining restaurants, Bali by the Sea and Village Steak and Seafood. and the Rainbow Lanai restaurant. It is the most recognizable tower and has the best views and the rainbow mosaic on the sides of the tower is listed in the Guinness Book of World Records as the tallest mosaics. The rooms are dated as are the main areas, but it is comfortable if you are looking for convenience to the beach, pools and the ocean views. 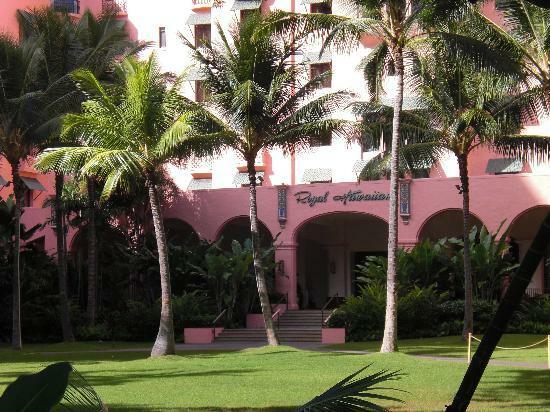 Each room has a balcony/lanai and the regular hotel room type amenities. I felt like I was in the 1960's in this tower - just like a lot of other places in Hawaii. But the views are spectacular and the location made up for all of it. Other than a timeshare condo this is the best tower for families as it is close to all the things the kids will want to do! It is close to the Super Pool and the Lagoon too. The Tapa Tower at the Hilton Hawaiian Village Hotel has been renovated recently and is the perfect tower for business travelers. It has it's own conference center - the Tapa Conference Center - and I would only recommend it for business travel as it is a bit of a walk to the beach. It does however have it's own pool, the Tapa Bar , which features live music in the evening and the Tapa Cafe. It is centrally located to all conference areas. When we were there there was a big conference on and this area was always filled with people doing business. 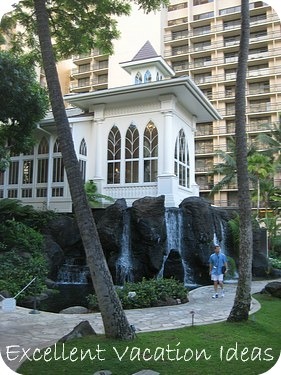 The wedding chapel in the Hilton Hawaiian Village Hotel is located right next to the Tapa Bar. Michelle and Andy got married in the Gazebo off of the chapel and it was a beautiful spot! The Kalia Tower is where the Mandara Spa is located. 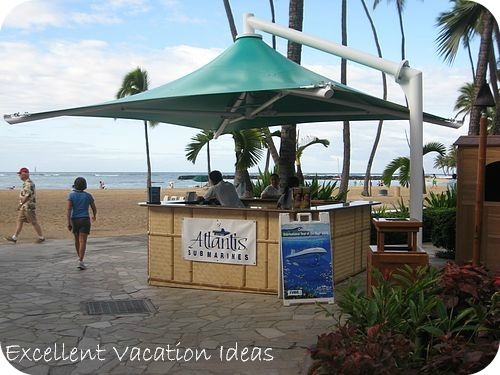 It is located in the lush garden area at the entrance to the Hilton Hawaiian Village and is perfect for those that like to luxuriate in the spa. They have a great fitness room and their own pool. We tried the Mandara Salon for our hair and Michelle (the bride) had her hair and makeup done for her wedding. The staff were friendly and we were happy with the service. It really is a beautiful Spa and tower. Plus a bonus - there is a Starbucks in the lobby. 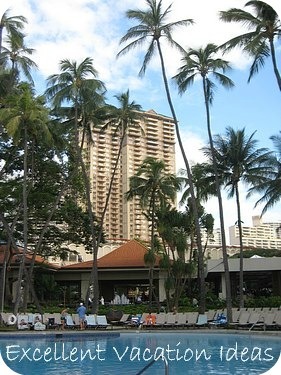 The Diamond Head Tower in the Hilton Hawaiian Village Hotel is an original tower at the Hilton Hawaiian Village Hotel. 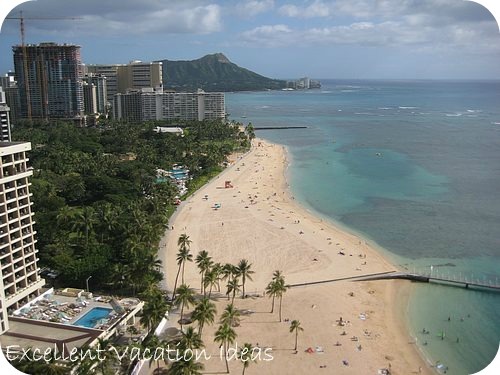 It have views of Diamond Head on the East side and is close to the beach and Tapa Pool. 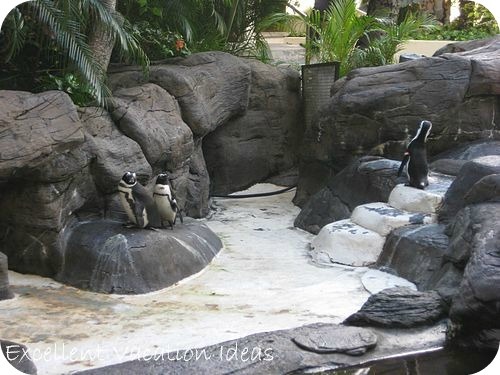 It is also close to Village Green that houses the resident South African black-footed penguins, turtles, flamingos and swans. These are a hit with the kids and I noticed that Warren and I spent a lot of time there too! 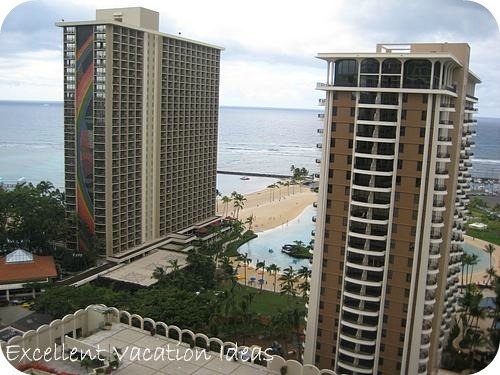 The Lagoon Tower and the new Grand Waikikian are the time share properties - part of the Hilton Grand Vacations Club. While we were looking into reservations - this came up and was perfect for us. We were bumped up to a 2 bedroom suite on check in and it was EXCELLENT! We had 2 bathrooms, a full kitchen and a view of the resort and the ocean. We had access to all of the resort's amenities but it was a bit of a walk to the rest of the resort. We didn't mind as it helped with the extra food we were eating! There is a separate check in and website to reserve your room at and it may cost a little more, but we like the extra space and comfort. We had to prepay our room but that also gave us a better price. 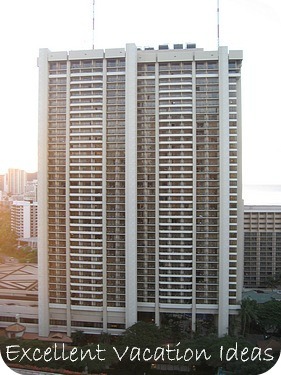 The Grand Waikikian is new as of December 2008 and located at the Hilton Hawaiian Village Hotel.